Does your child have a health condition, allergy or a sensitive nose? Have you always thought of having a chemical free environment for your baby to crawl and play around? Now, with Kärcher Steam Cleaners, you can have all of the above! 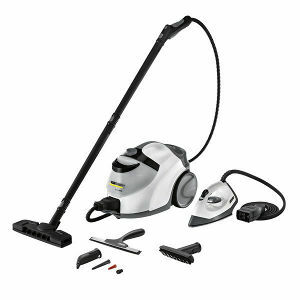 Marble, glass, granite, metal – Kärcher Steam Cleaner is able to remove stubborn dirt and stains from almost any surface. There are three different models: SC 3.000, SC 4.100C and SC 6.800C. The difference between these steam cleaners is their heating capacity, tank capacity and steam pressure. If you are looking for a continuous and reliable steam cleaning coupled with multifunctional features, you may want to look at the model SC 6.800. This new and improved model not only comes with a steam iron, it distributes steam more equally and efficiently. Kärcher believes in keeping homes spotless, at the same time allergy-free and safe for children. This means no soap, kitchen spray cleaner or any cleaning agents which contains chemicals. With its powerful 4.2 bar steam pressure and 2200 Watts of heating capacity, the SC 6.800 delivers non-stop steam for pure cleanliness without chemicals. For some parents, it was this non-chemical and sanitizing advantage that won them over. In the Kitchen, you can clean…floors, cooker hoods, sinks. In the Toilet, you can clean… bathroom floors, shower screens, shower heads, mirrors, sinks. In the Living Room/Rooms, you can…remove wallpaper, clean air-conditioners, remove lint and odours on clothes (e.g blazers and jackets). If the above list of things to clean isn’t enough, you can even use the steam function to sanitize your children’s toy and equipment. 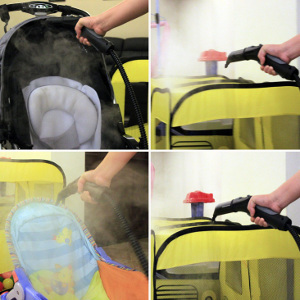 New mum Melina tried the Steam Cleaner to clean her girl’s play tent and rocking chair. Her advice? “Sanitize the toys at least an hour before your child uses them, especially if it’s cloth-based as it will be a little damp and hot.” She also added it was best to test the machine a little by little first on complex surfaces, before spraying onto the whole surface. With a short heating time of only 3 minutes, the machine also has a child lock on the steam trigger gun to protect the child in the case of any misuse. Are you tired of scrubbing those tough stains in your kitchen sinks and bathroom tiles? With Kärcher’s latest jet steam technology, you no longer need to flex your muscles and scrub hard to get those tough stains out. With the four-stage steam flow regulation, you can even adjust the degree of steam flow to suit to the level of dirt. Have a stubborn greasy stain that won’t go away? Simply use the VapoHydro function. This allows hot water to be used together with the steam, dissolving and washing the most stubborn and dirtiest grime. For Mable, a mother of two young kids, using Kärcher’s SC 6.800 was a lot less physically taxing. For the stains that were around for months, all she needed was to turn up the level of steaming intensity, steam the spot a little longer and the stain was gone! Ready, set, and steam away!